The way Lake Erie looked during the water crisis August 4, 2014. Crystal Jankowski went into labor during the 2014 water crisis in Toledo, Ohio. The city’s 276,000 residents couldn’t use their tap water at all for a weekend in August—no drinking, bathing, nada. The water, supplied by Lake Erie, had become toxic due to the lake’s dangerous algae overgrowth. Jankowski, who was preparing to give birth to her daughter in nearby St. Luke’s Hospital, had spent the last day with minor contractions. She knew her moment was coming, so she stressed over her inability to take a simple shower. That event changed her life. And she didn’t let it end there. As a mom who’s committed to community involvement, she and her neighbors worked to form a local environmental group, Toledoans for Safe Water. This week, they succeeded in passing a vote to develop the Lake Erie Bill of Rights Charter Amendment that recognizes the lake’s right “to exist, flourish, and naturally evolve,” as described by the Community Environmental Legal Defense Fund (CELDF), which partnered with Toledo residents to secure this special election. While similar laws recognizing the intrinsic rights of ecosystems have passed in Colombia, New Zealand, and India, this is the first of its kind in the United States. The group “ugly cried” after finding out the vote passed by 61 percent Tuesday, Jankowski said. 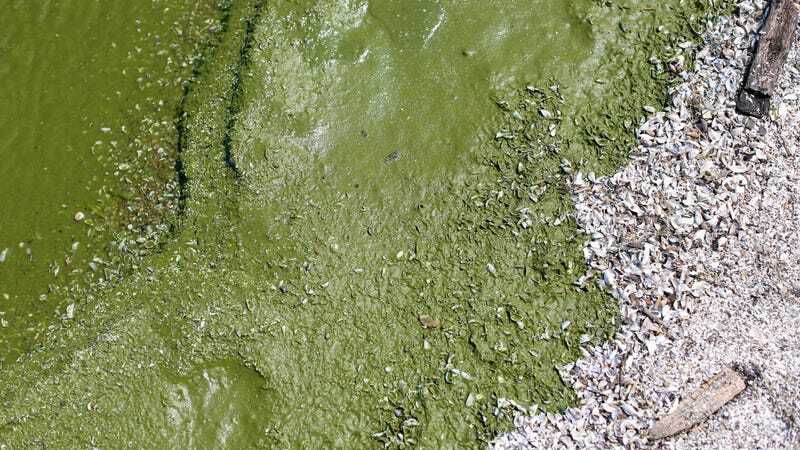 These new rights granted to Lake Erie are supposed to help protect it from the nitrogen and phosphorus-rich runoff, mainly from the agriculture sector, that fuels the algae blooms. Lake Erie suffers from these blooms most summers, though they range in intensity. The blooms not only threaten drinking water; they hurt the economy by putting a damper on the recreational fishing industry and on tourism revenue. A bloom like the one in 2014 could result in $65 million in lost benefits to the local economy. The problem’s gotten so severe that even local breweries are raising awareness through algae-infused green beer. And climate change is expected to worsen these blooms because high temperatures not only affect this algal growth, but the unpredictable weather patterns brought on by climate change may increase the region’s rainfall, causing more runoff to enter the lake. The so-called Rights of Nature movement isn’t without its critics, but it gives environmentalists and stakeholders a legal option to protect a natural body when environmental regulations fail. Toledo, however, is unusual in that its residents voted to recognize these rights; historically, such decisions have come about through a court ruling. It’s unclear how well this new amendment will stand up in court, but the Drewes Farm Partnership, an agriculture operation in Northwest Ohio, is already challenging the decision’s constitutionality in a complaint filed Wednesday in the U.S. District Court for Northern District of Ohio. Tish O’Dell, the Ohio community organizer for CELDF isn’t too worried about whether the new amendment survives legal challenges. She knows laws won’t flip overnight. “[This amendment is] about not only changing the law, but it’s about changing our culture and our relationship with nature and the environment,” she told Earther. The hope is that this amendment inspires other communities around Lake Erie—and other parts of the U.S. dealing with water issues of their own—to plot similar local ballot measures. Maybe this amendment doesn’t survive in court, but others might. In the meantime, many locals are celebrating. Perhaps with an algae-inspired sour double IPA in hand. Why Did This Lake Suddenly Turn Blood Red?